1. Hepatocellular Carcinoma: Overcoming Challenges in Disease Management Read article. 2. Lercanidipine’s Safety Profile: The Benefits of Lipophilicity Read article. 3. Shifting the Clinical Paradigm: Treating Systolic Blood Pressure to Goal Read article. 4. A Multicenter, Randomized, Double-Blind, Parallel Group Study Comparing the Efficacy of a Fixed-Dose Combination of Amlodipine plus Benazepril HCl Versus Amlodipine in the Treatment of Stage 2 and Stage 3 Hypertension (The Solace Study Write Up.) Read article. 5. ACCOMPLISH (Avoiding Cardiovascular Events Through Combination Therapy in Patients Living with Systolic Hypertension): Trial Design and Rationale by Kenneth A. Jamerson; George L. Bakris; Bjørn Dahløf; Bertram Pit; Eric Velzaquz; Michael A Weber Read article. “Pregnant Women and AIDS Clinical Research,” [Letter] first author, of original data, coauthored with Dr. Wendy Chavkin and Theresa M. McGovern, Esq., in the New England Journal of Medicine, December 9, 1993. See full article. “Treating Health: Women and Medicine,” co-authored with Barbara Katz Rothman, Ph.D., in Women: A Feminist Perspective, 5th Edition, Edited by Jo Freeman (Mountain View: Mayfield Press, 1995). Order the book. 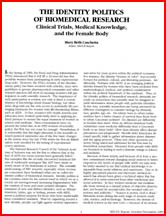 “Access to Clinical Trials: A Political and Legal Analysis,” Coauthored with Theresa M. McGovern, Esq., in the Journal of the American Medical Women's Association, July 1994. Read this article on line. “Diagnosing and Managing Peripheral Neuropathy in HIV Disease,” for Bristol-Myers Squibb, Immunology, 1998. “Norplant,” in The Encyclopedia of Birth, Edited by Barbara Katz Rothman, (Oryx Press, 1992). You can buy this book. “Thalidomide, HIV, and Women: A Policy Paper Prepared for the PWA Health Group of New York,” Presented to the Food and Drug Administration (FDA), 1994. The paper was translated for patients. “Deconstructing Biological Determinism and the False Promise of Science,” Organized panel on the social construction of the “gay gene,” and presented paper at the annual conference by the Society for the Study of Social Problems, Los Angeles, 1994. “HIV Violence: A National Report Published by the New York City Gay and Lesbian Anti-Violence Project and the National Association of People with AIDS,” 1996. “Recommendations and Considerations for Launching Lesbian-Dedicated Health Services: A Critical Analysis for Beth Israel Medical Center, New York City,” 1996. “Sexuality Research in the United States: An Assessment of the Social and Behavioral Sciences,” for the Ford Foundation and the Social Science Research Council, 1996, (edited). “The Adolescent Sexuality and Pregnancy Prevention Replication Manual,” for the Bernice and Milton Stern National Training Center for Adolescent Sexuality and Family Life Education, the Children’s Aid Society, 1996. “Lessons for Lifeguards: Working with Teens when the Topic is Hope” by Michael Carrera. (ghostwriter). Buy the book. “New York State Recommended Guidelines for HIV Testing and Counseling in a Primary Care Setting,” for the New York State AIDS Institute Office of the Medical Director, 1995. “Guidelines for HIV Testing and Counseling in Foster Care Settings: A Policy Paper for the AIDS and Adolescent Network of New York City,” 1994. Consultant, “U.S. Public Health Service Recommendations for Human Immunodeficiency Virus Counseling and Voluntary Testing for Pregnant Women.” MMWR, July 07, 1994/44(RR-7):1-15. To read the report. "MB is an outstanding medical writer who can write multimedia content for any audience from consumers to sales reps to physicians. She always does an awesome job, regardless of size, scope or deadline!! And she delivers on time, every time." "It's hard to find writers who can blend science with sell, but Mary Beth does it with style. She's a versatile wordsmith who is equally adept at writing that all-important headline or a clinical paper that comes with a crunch deadline attached. She's on the short list of writers we turn to again and again."